Looking Back: It’s True, It Works! Originally published in Love Sparks and Prisms, Illinois, and republished in the January/February 1983 issue of La Leche League News. Editor’s Note: The first issue of La Leche League News, the bimonthly publication for members, was published in 1958. The name changed to New Beginnings in 1985. New Beginnings continued to be published until 2014 when it transitioned to its current blog format at www.lllusa.org/blog/. My second baby, Robert, was a Clinger Extraordinaire. Until he was about 18 months old, he would have nothing to do with anyone but me. I could not leave the room without him, much less the house. Consequently, I became the source of much gossip among neighbors and acquaintances. My only haven was with my League friends and my husband, Vince, who understood Robbie’s baby ways. Well-meaning neighbors predicted dire consequences for Robbie and me. They offered much “free advice”; they said that Rob would be so dependent on me as he grew up that my life would be ruled by him. They suggested that I leave him with a sitter on a regular basis so that he would get “used” to being without me. I became a closet nurser and Robbie nursed until past his third birthday. I often told my husband that if we met Robert’s needs when he was a baby, then when he was good and ready, he would feel happy and comfortable with other people. After all, this is what my LLL reading had been telling me. But I must admit to days when I questioned if I would ever have any time to myself again. Well, today, I have the morning to myself. My little Robbie, now almost five, started kindergarten. As I walked to school with him, he ran two hundred yards ahead of me, skipping, hopping, and occasionally turning around to shout, “Come on, slowpokes,” to his big sister and me. I walked home with a lump in my throat realizing his baby days were behind him. I felt so good inside, knowing he had outgrown his strong dependency needs. I would encourage any mother with a new baby: Don’t ever be afraid to meet your baby’s needs. It may be tough going at times, but the end result is a wonderful feeling of accomplishment and many less troubles in later years. Thank you LLL for all the insights you have given me into mothering. Not all dependent little ones get over this stage as quickly as Robbie did. But, it’s true that meeting the needs of one’s baby sooner or later makes for a well-adjusted, secure, loving, and independent child. 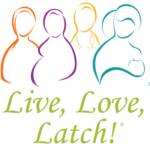 THANK YOU for your participation in Live, Love, Latch! events throughout August in celebration of National Breastfeeding Month. Live, Love, Latch! is a National Breastfeeding Month celebration presented by La Leche League USA and hosted by LLL Groups throughout the country.